Quick, click this link and you might win a chicken! This is a promotion, of course, for the Timber’s new release Free Ranch Chicken Gardens, which is a cute book on creating chicken friendly gardens. 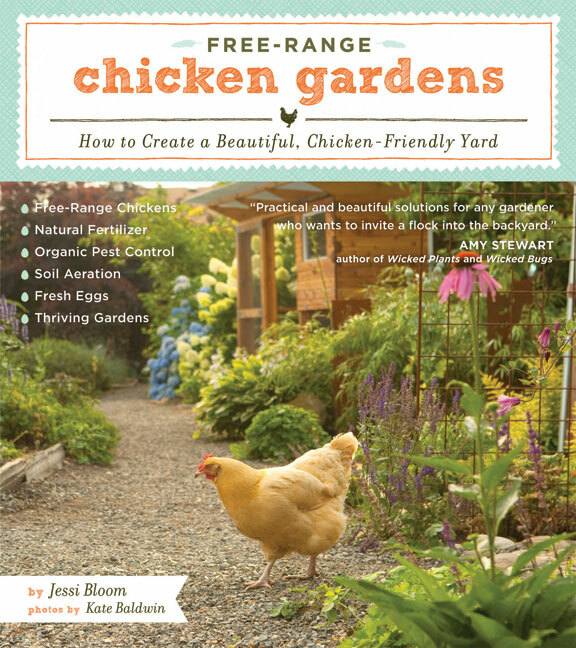 Free-Range Chicken Gardens is written by Washingtonian Jessi Bloom who is a garden designer and a chicken mom. Jessi is a proponent of free range chickens, though she realizes that isn’t a possibility for all chicken lovers. Instead, she offers practical alternatives to giving your chickens the run of the yard. She also covers chicken care, which chickens to choose (there are lots of varieties), protecting chickens from predators (like bald eagles! ), plants chickens love and those they avoid, coop designs, and other useful topics. Its been more than 30 years since I last gardened with chickens. I’ve thought about doing it again but dealing with kids, cats, and dogs took priority in recent years. After reading Jessi’s book, though, I might just give it another try. Please, don’t tell my husband!